Breeders specialising in Manx at that time included the Woodiwiss brothers, Miss Samuel, Mr. Jungbluth, Mr. & Mrs. H.C. Brooke and Mr. Gambier Bolton. Others to share in this interest were Lady Alexander, Miss Jay, (better known for her Blue Persians), Mrs. Moseley, and Miss Hester Cochran, the latter who eventually gave up all other breeds to specialise only in Manx, and who in due course became the Honorary Secretary of the Manx Cat Club when it was duly formed in 1901. Despite these difficulties, the plucky Manx breeders persevered, and although the club was never a large one, it did contribute to the success of the Manx breed remaining a force to be reckoned with at the larger shows, by the guarantees it provided for multiple classes and prizes. 'Golfsticks' was Miss Samuel's first top show specimen, and as would soon become apparent, she would herald the beginning of a consistency in conformation, both within the breed, and within a specific bloodline that, hitherto, had not been seen before. 'Golfsticks' was born in July, 1900. (NCC: Vol.6). Her sire is recorded as 'Manx Philip' (aka Philip I) and her dam was 'Teenie Tinee'. She was of course, bred by Miss Emily Samuel of Hackney, who was very quickly establishing a name for herself by producing Manx of consistently good conformation. This particular breeding she had done before, and it would be repeated again to produce other show winners. 'MOFF-TOFF'	Born 16th May, 1899. Breeder: Miss Emily Samuel. Owners: (1) Mrs. Higgins,	(2) Miss A.K. Clifton, (3) Hester Cochran. 'BEELZEBUB'	Black Manx male, born 27th June, 1900. 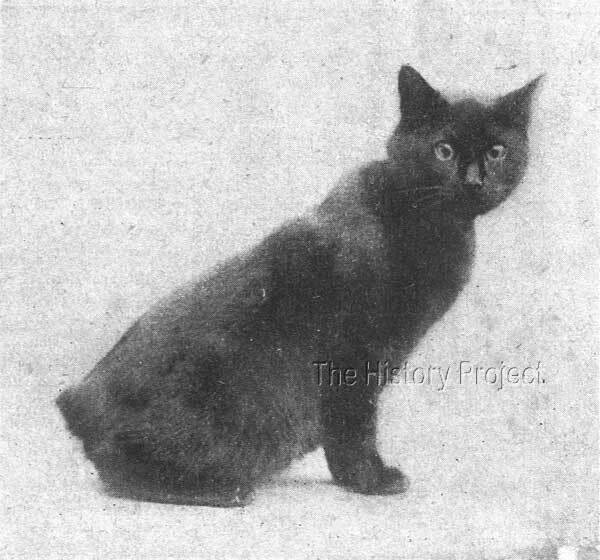 'LUCIFER II' Black Manx Female, born 4th July, 1900. 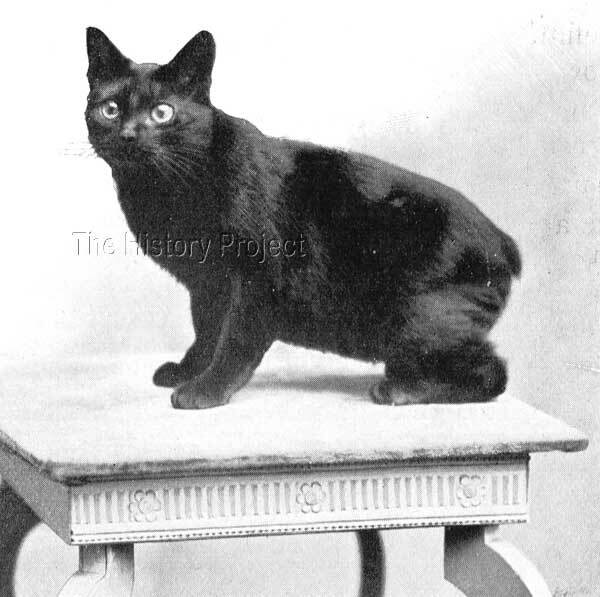 'LUCIFER III' Black Manx female, born 4th July, 1900. 'BOYGUM'	Black Manx male, born 19th February, 1904. Bred by Miss E. Samuel and sold to Mr. Victor Lowe. 'MANX GIRLIE'	Black Manx female, born 19th February, 1904. 'DONALD DUMPKINS'	Black Manx male, born 25th June, 1904. Bred and owned by Miss E. Samuel. In addition to this recorded win at the Crystal Palace in 1901, we also find that she was placed 2nd at the Crystal Palace Show of 1902, and 1st at the Crystal Palace Show of 1903. It is often difficult to find relevant stories or information about specific cats, and the usual scenario is that we have to find relevant registration data for progeny in order to build a timeline for the cat and a picture of its breeding history, and if we are lucky, this may lead to clues on where else to look. "What a long time since I have been able to find time to send you any news of my pussies. I am always so interested reading news about other people's cats and kittens, and people are good enough to tell me that they look forward to reading about mine. I am glad to say that they are all well, but so far there are only two kittens, and I do not mind that as the weather has been so trying. It is better for them to arrive later in the year. The two I have are grand blacks, and it is amusing to watch them at play. They can find me in any part of the house, and though only 9 weeks old give me quite an ovation when I return from a walk. "I am hoping for a good litter next week from Manx Foggotty. She is a tabby, a daughter of Monarch, and during the day she follows me everywhere. No matter where I am or what I am doing, Foggotty is always beside me. At night she comes up and sleeps on a box in my room. Golfsticks, who always feels the cold very much, will sit and howl like a puppy until I say 'Footwarmer,' and then she jumps about in a state of high glee until the bottle arrives. "Manx Philip celebrated his 6th birthday in March, and he looks as young as his two year old sons, and is quite as frisky as they are. When I say 'Phil, where is the cheese?' he will get on the table and take the cover off the cheese, and then wait to be helped to a piece. "Foggotty is quite wild if you mention eggs to her; and Kangaroo loves fish. Little Jupkins can stand on his hind legs and turn the handle of the door. "Golfsticks, who always feels the cold very much, will sit and howl like a puppy until I say 'Footwarmer,' and then she jumps about in a state of high glee until the bottle arrives. She simply hates physic, and she hates other cats too, but when I smear medicine on her nose and mouth she goes about rubbing into other cats most lovingly, until she has got rid of all the stuff I treated her to. "Moff-Toff, is quite taken up with other cat's kittens, and carried off seven a foster cat had, and put them in a box nearly as high as the ceiling. I tried to make her contented with three, and even four, but she would keep stealing the seven, though she has not has any of her own for a long time and is not expecting any. "Dotty Kelly is not in kitten either, and has not had any for some time, but she has adopted a stray English. She calls it to her bed of a night, and keeps for it, some of her food, and is perfectly miserable if parted from it. Dottie is a most intelligent and amusing cat; she obeys just like a dog, and watches every look when we are talking, and understands perfectly the difference between a frown and a smile. "Witch mostly devotes herself to her babies, and the two blacks I have now belong to her, so just now she stops at home, but when she wants to walk abroad she can move a chair away and open the door, and let herself out; she can also open the door of the safe, and help herself to the fish. I have never known her take any other food; she evidently likes fish best. She soon learnt to move the button on the door and help herself. "I must not forget to mention our lovely Blue Persian, just six months old, with a grand pedigree. She is a lovely cat, but uses dreadful language, and spends all of her time driving the Manx about. She simply hates them, and, I believe, they are quite disgusted with her fine tail. It has been highly amusing to watch the war between the Persian and the Manx when they meet. This is the first Persian I have ever had, and, though I like Manx best, I intend to breed some good blues if I am lucky with this little Queen. So, "Our Cats" will hear more of her in the future, perhaps. 'GOLFSTICKS' bred and owned by Miss Emily Samuel. When the successes in the show ring procured by 'Golfsticks' were later duplicated by her younger full sibling, in 'King Kangaroo', Miss Samuel's reputation as a breeder of consistent quality in Manx cats was reaffirmed. Nothing is more noticeable or desirable than consistency of breeding to type, health and character. Miss Samuels had begun to set new standards for others to follow, and duly led by example.